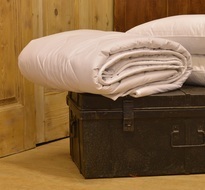 SlumberSlumber are proud to bring you our new wool bedding range lovingly handmade by Penrose in Nottinghamshire. This sumptuously soft range is made from 100% English sheep’s wool, from animals bred on the Northern Dales of North Yorkshire, Cumbria and Northumberland, which makes our wool bedding truly traditional. The range carries the Vegetarian Society seal of approval as the animals receive the best care and nutrition, and the wool used is only taken from animals that go back to the field. Production of our products is completely eco-friendly, no toxic chemicals or dyes are used in the manufacturing process, and the cotton used in our organic bedding is purchased with a GOTS Certificate. The wool is naturally anti-allergenic, with temperature regulating and moisture wicking properties, this makes it the ideal choice for allergy sufferers. All these qualities make this Penrose wool bedding range an effective way to enhance the quality of your sleep. Our sleep clinic has all you need to know about wool bedding.